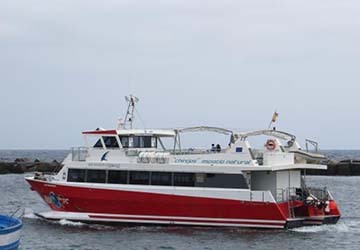 Biosfera Express is a family-run ferry company based in La Graciosa in the Canary Islands, off the west coast of Africa, providing frequent crossings to and from Orzola on the north coast of Lanzarote. The family operating Biosfera Express has long been involved with the deep-sea fishing industry and so have plenty of sailing experience in this part of the world, which means you can be assured you’re in capable hands. With their fleet of high-speed catamarans and team of knowledgeable staff, passengers are guaranteed a safe and pleasant sailing experience every time. On board their 250-capacity vessels, you’ll find spacious lounge areas, excellent toilet facilities, bars and music equipment. You can even enjoy some delicious barbecued seafood whilst admiring the panoramic sea views aboard the ferry, ‘Cap Menorca’. The second ferry, ‘Badia de Soller’ has a large sun roof where you can gaze out to the beautiful Canary coastlines. 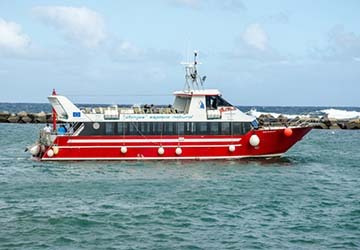 With directferries.co.uk you can find Biosfera Express timetables, fares and book Biosfera Express ferry tickets. Where applicable we’ll also compare Biosfera Express with alternative ferry companies.